Just a few minutes before, I'd been standing by the side of the road and hailed the cab. "Frontera? ", I asked. The driver nodded, pulled over and popped the trunk. I deposited my bags and squeezed onto the rear bench, joining the other five passengers already crushed inside. Shared taxis in Morocco may be an economic way to travel, I thought to myself, but not always a comfortable one. When we were less than a mile from the border, I noticed that cars were suddenly slowing down and stopping up ahead. However, our vehicle continued accelerating. The absent-minded driver realized his predicament too late. He slammed on the brakes, only to have them lock beneath us. The overloaded taxi proceeded to violently skid into the car in front. Thankfully no one had been hurt. After the fender-bender victim took down our vehicle's license plate, noted the name of the taxi company, and yelled his fair share of Arabic epithets, our frazzled driver stepped back behind the wheel. He turned the ignition and we slowly advanced to the border. I paid my share, took my things out of the trunk, and exhaled a sigh of relief. Yes, I said to myself. I was going to make it to Granada. In fact, Spain was so close that I could touch it. Despite being on African soil, the city of Ceuta has been under Spanish rule since the 17th century. 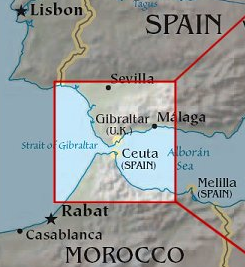 It is situated almost directly across from another geopolitical oddity, the British-controlled territory of Gibraltar. The Strait of Gibraltar has historically been one of the most important sea passages in the world. Whoever controlled it, controlled access from the Mediterranean Sea to the Atlantic ocean. It was a strange feeling to walk into Spain from Morocco. All the din and disorganization of the developing world was suddenly replaced by the cleanliness and order of the developed one. Arabic was replaced by Spanish, and the Euro replaced the Moroccan dirham. This was Europe through and through. After checking into a hostel, I went out to explore. Ceuta is very small, so it didn't take long to cover a lot of ground. I eventually made it to the medieval walls that formerly protected the city from sea invasion. I climbed to the top of the stone walls, and stared across the sea toward the massive Rock of Gibraltar. This was a most curious view. Here I was, in Spain yet in Africa, staring at an outpost of Britain surrounded by Spain! View from Ceuta. Just 13 miles across the strait lies the Rock of Gibraltar, seen in the top left. The next morning I caught a taxi to the city's seaport and bought a ferry ticket to the mainland. Just forty-five minutes after departing from the African continent, we docked in the city of Algeciras, Spain. I walked over to the local bus terminal and boarded the next coach bound for La Linea de Concepcion, the town neighboring Gibraltar. From there it was another short walk to the oddest border crossing I've ever been through. A signboard of Ronald McDonald greeted me, and no one in customs bothered to check my passport. I was now in Great Britain. The border crossing was certainly unusual, but something even more unexpected transpired when I walked the sole road into Gibraltar. Just 400 yards after the frontier, I came upon a large intersection. This was not just any road that I was crossing, however. This was a live airport runway. Incredibly, the only way to access Gibraltar by land is by crossing this runway. As there were currently no planes taking off or landing, I lugged my bags across the airstrip and entered the city. Just as I'd immediately noted the cultural difference when I passed into Ceuta, I was now keenly aware that I was in Britain. There were double-decker buses, red telephone booths, and giant billboards saluting the Queen. The pedestrianized city center felt just like how I imagined a jolly old London neighborhood to be, with stately victorian buildings lining both sides. There were also enough pubs to drown the British navy. The day after arriving in Her Majesty's Iberian enclave, I vowed to climb up the giant rock from which the territory takes its name. Under a brutal August sun I began the trek through the city and up to the rock. I came to the entrance of a fascinating part of Gibraltar's history. Many tunnels were hollowed into the Rock in the late 1700's by a British military eager to repel sieges by invading forces. Visitors can now pass through some of the tunnels, and learn about the historic defense of this strategic point. After touring the tunnels, I walked up to a viewpoint and gazed to the north. The Spanish mainland was ahead, and the airport runway directly below. I noticed that cars and pedestrians had been stopped on either side of the strip. A plane was lining up to take off. Something else unique to Gibraltar was waiting for me on the other side of the Rock. Namely, hordes of macaques. Gibraltar is home to the only remaining wild monkeys in Europe, who just happen to inhabit the upper reaches of some of the continent's most stunning scenery. The next morning I arose early and crossed back into Spain. My trip was nearly over, and at long last I was returning to Granada. They say that your first love always remains with you. I believe that this is true not only with people, but also with places. The first place that ever moves you emotionally, that challenges you to grow spirtually, that sweeps you off your feet and makes you truly see the beauty around you, stays with you forever. When I stepped foot in Granada for the first time in nearly a decade, all of the emotions I'd associated with this place, these people, and the formative experience I had here came flooding back. In the warm summer evening I ambled through Granada's charming streets and lovely plazas in a daze, unable to fully comprehend that I was really back in the city that started me on the journey to becoming so much of who I am today. 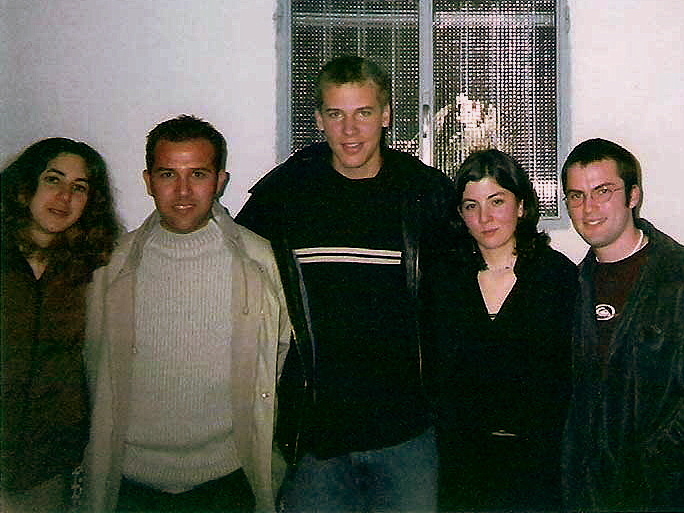 As a fresh-faced twenty-one year old university student, I had arrived in Granada with plans to study Spanish for a semester. It was the first time I'd ever been outside of the United States. Everything was new: the culture, the architecture, the food, the music, the people. My eyes were suddenly opened to a totally different way of life. I couldn't have chosen a better place in Spain in which to spend five months. Unlike the bustling metropolises of Madrid and Barcelona, Granada has a small, manageable size. It is also achingly beautiful. Narrow cobblestone streets wind past cathedrals and moorish arches. On a tree-covered hill above stands the exquisite Alhambra palace, the most picturesque remnant of Islamic rule in Andalucia. And stunningly towering over all on a clear day is la Sierra Nevada, the highest mountain range in Spain. As I wandered the streets of Granada anew, seemingly every corner brought some long-buried memory to the surface. I walked by the flat where I used to live, browsed through the stores where I used to shop, and visited the school where I formerly studied. After spending much of the last year in unfamiliar places and around unfamiliar tongues, it was such a joy to be somewhere I knew well, and in a place where I could fluently converse with locals. And most of all, it was wonderful to reunite with friends with whom I'd shared some of the best memories of my university years. I first met Cecilia and Fatima through the exchange program coordinated by the language center of the University of Granada. Over the following months the two Granada natives would become good friends, often inviting my American roommate Jason and I along to enjoy the city's sangria-fuelled nightlife. We'd kept in touch ever since through e-mails, facebook, and postcards. So it was fantastic to finally see them again, as well as to be welcomed into the home of Ceci's family. We may have grown older but, as with all true friendships, it felt as if no time had passed at all. As the Andalusian sun lowered over Granada, I realized that a major part of my life had come full circle. A decade ago, this place, this experience, had awakened a wanderlust that would eventually compel me to journey across five continents and thirty-two countries. During that adventure I'd be fortunate to witness many of the world's remarkable sights, make friends from all corners of the globe, and live through enough unique experiences to fill several lifetimes. The sun touched the horizon and dusk set in. I took out my guitar for one last song. I'd played its melody hundreds of times before, but never in a more appropriate place. The final notes of Recuerdos de la Alhambra left my fingertips and resonated over Granada. I'd like to think that there they still linger, waiting for my return. Adam, thank you so much for sharing this journey with us all. It has been truly magnificent to watch your journey around the world. These are some of the best photographs I've ever seen. Thank you thank you thank you. Great way to end travels around the world by visiting Spain, and well narrated experiences!! I came across your site through another travel site, I don't remember which, but anyway, I really enjoyed this post. I was drawn in by the photo that I immediately recognized as Granada. I spent a few months there and loved it. Thanks for sharing.